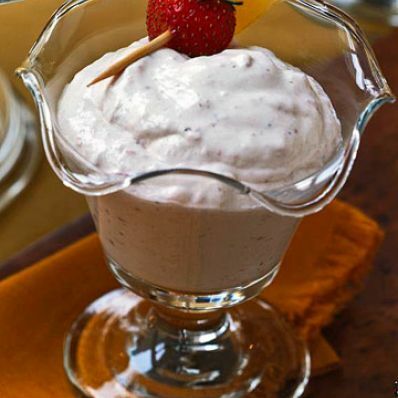 Indulge in a tropical treat with this low-calorie dessert. Fresh strawberries add to the fruity flavors of mango nectar and pineapple. 1 of 4 Sprinkle gelatin over 1/2 cup of the mango nectar in small saucepan. Let stand until gelatin softens, 1 minute. Stir over low heat until gelatin is dissolved, about 1 minute. Cool to room temperature. Stir in remaining 1 cup mango nectar. Pour into large bowl; refrigerate 10 minutes or until cool to the touch. 2 of 4 Remove gelatin mixture from refrigerator. Add lemon juice; beat on medium speed 2 to 3 minutes or until slightly frothy. Fold in whipped topping. Chill for 15 minutes. 3 of 4 Puree strawberries in food processor or blender. Add 3/4 cup of the pineapple chunks to strawberries; pulse until pineapple is coarsely chopped. Fold strawberry mixture into gelatin mixture. Return to refrigerator 15 minutes. Spoon fool mixture into 8 dessert glasses or pudding dishes. Cover each glass or dish, and chill until ready to serve. 4 of 4 To serve, slice whole strawberries in half for garnish. Skewer a strawberry half and a pineapple chunk on each of 8 wooden picks. Use to garnish dessert.